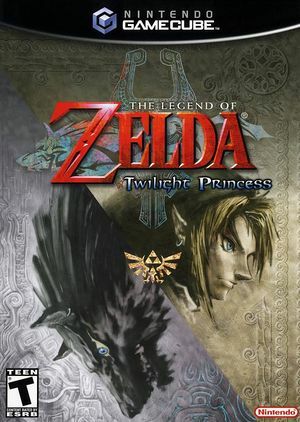 The GameCube version isn't mirrored like the Wii version and has free camera control. 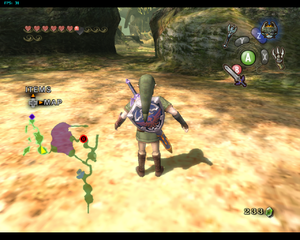 The GameCube version lacks motion controls while the Wii version does not support the GameCube controller. 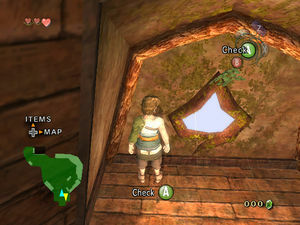 Although it can be patched from 4:3 to 16:9 as detailed below, there's no native widescreen support, unlike the Wii version. As the player progress through the game, Hyrule Field will become progressively slower. To fix it, enable the "Hyrule Field Speed Hack" in the ISO properties (right click the game in the game list > Properties > Patches tab > Hyrule Field Speed Hack). The NA and EU releases had the patch added to their GameINIs in 4.0-1767, then JP was added in 4.0-7318. Unfortunately, the hack will reduce the quality of the minimap, so be warned. On Direct3D api, minimap will have some noise artifacts if Anti-Aliasing, Anisotropic Filtering, or Texture Filtering are enabled. Disable all 3 in order to get "clean" map. For OpenGL, disable Anti-Aliasing. The Hyrule Field Speed Hack removes some graphical effects from the minimap. 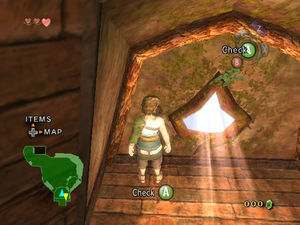 The built-in Widescreen Hack causes clipping and reflection issues. The following Gecko codes work as a replacement, causing fewer issues. To avoid conflicts, make sure that Widescreen Hack is disabled while using these codes. Due to Dolphin's Scaled EFB setting, bloom can turn into "ghost" images around objects in areas with high amounts of bloom. Bloom can be corrected with the following gecko codes. Use the x4 or x8 code, whichever is closest to your Internal Resolution setting. Keep Scaled EFB on. Disabling Scaled EFB Copies can also reduce bloom ghosting at higher resolutions, by rendering the effect at its native resolution. It may, however, render other effects at the native resolution, and can decrease the clarity of these effects at higher resolutions. By Victor Rosa. Their site is here. This texture pack is mostly complete and is in progress. By ZeldaGamer23. Their site is here; however, it is currently not hosting the project. This texture pack is incomplete and is in progress. It is experiencing financial difficulties, and a release date is unknown. r6271 Windows 7 Intel Core 2 Duo E7500 @ 2.93GHz ATI Radeon HD 4850 Fully playable and no slowdown in Hyrule Field (only when ZTP hack is enabled, otherwise you will get only 10FPS). r6815 Windows 7 Intel Core 2 Quad @ 2.4GHz ATI Radeon HD 4870 Fully playable in dungeons and in other areas but still slowdown in Hyrule Field (ZTP hack is enabled it helps but not so much, you obtain 15FPS). r6887 Windows Vista Intel Core 2 Duo T8100 @ 2.2GHz ATI Mobility Radeon HD 3470 Fully playable in dungeons and in other areas but still slowdown in Hyrule Field (ZTP hack is enabled it helps but not so much, you obtain 15FPS). 3.0 Ubuntu 12.04 Intel Core i7-3770 NVIDIA GeForce GTX 560 Awesome 30FPS all game no slowdowns and fully playable. Scaled 3x resolution and everything is great. 5.0 Windows 10 Intel Core 2 Quad Q6600 @ 2.4GHz NVIDIA GeForce GTX 550 Ti Near perfect emulation. Constant 30 FPS, some slow downs in Faron Woods, but runs perfectly fine overall. Hyrule Field very slow unless activating the Hyrule Field patch.